WSJ: RomneyCare's Failures in MA Not 'Widely Known'; I Wonder Why? An editorial in yesterday's Wall Street Journal bemoaned the fact that the state-run health system in Massachusetts is failing, and that its implosion isn't common knowledge. Formally known as CommonwealthCare, the Massachusetts scheme has the political name of "RomneyCare," in "honor" of the Bay State governor and former presidential candidate who championed its passage in 2006. The Journal understands that the Bay State Blowup is one of the media's least-covered stories because exposure of CommonwealthCare's true results would make all too clear the awaiting disasters found in the various versions of ObamaCare Congress is considering for the entire country. In a rational world, the prognosis for ObamaCare would wait on the evidence in Massachusetts, given that the commonwealth's 2006 program closely resembles what Democrats are trying to do in Washington. If the results were widely known, it might be dead on arrival. The Massachusetts law, which was championed by former GOP Governor Mitt Romney, imposed an individual mandate, requiring nearly all residents to buy health insurance or else pay a penalty. (The exceptions are those who qualify for the state's public program.) This was supposed to cover everybody and save money too. We've written before about how costs have exploded, but it also turns out that consumers have other ideas. Well, the returns are rolling in, and a useful case study comes from the community-based health plan Harvard-Pilgrim. CEO Charlie Baker reports that his company has seen an "astonishing" uptick in people buying coverage for a few months at a time, running up high medical bills, and then dumping the policy after treatment is completed and paid for. Harvard-Pilgrim estimates that between April 2008 and March 2009, about 40% of its new enrollees stayed with it for fewer than five months and on average incurred about $2,400 per person in monthly medical expenses. That's about 600% higher than Harvard-Pilgrim would have otherwise expected. The individual mandate penalty for not having coverage is only about $900, so people seem to be gaming the Massachusetts system. "This is a problem," Mr. Baker writes on his blog, in the understatement of the year. "It is raising the prices paid by individuals and small businesses who are doing the right thing by purchasing twelve months of health insurance, and it's turning the whole notion of shared responsibility on its ear." Mr. Baker is right, though he underestimates the extent to which it is rational for people to do this, considering the government-mandated incentives. To one degree or another all insurance pools require the younger and healthier to subsidize the older and sicker, though part of the risk-sharing bargain is the hedge against unanticipated or future health problems -- i.e., true insurance. The combination of guaranteed issue and community rating actively encourages parts of the healthier population to forgo coverage and thus blow up voluntary risk pools. No doubt our politicians will conclude that the solution is to raise the penalty for going uninsured, though it would be easier and more rational to let insurance markets function without mandates. But the statist politicians who dominate the Massachusetts legislature didn't want "easier" and "more rational"; they wanted "more controlled" and, with Ted Kennedy cheering them on (see picture above), "more national." 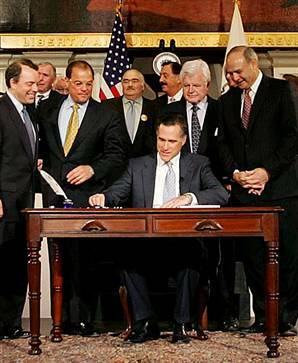 The failure to recognize this ultimate objective, and to thus get co-opted into concocting a scheme that he naively thought would be enough to appease the statists, is Mitt Romney's most obvious economic policy failure as Bay State governor. As to the media, almost nothing of what is going wrong in Massachusetts gets reported outside of New England. Even when problems do get noticed, newspapers like the Boston Globe persist in describing CommonwealthCare aka RomneyCare as a "grand experiment" and "trailblazing." Rationing is already occurring; yet a Globe reporter recently described the 12% cost cuts necessary to stay within budget as mere "trimming." If the failures of state-run health care in Massachusetts were more widely known, the clear and imminent failure of what might become ObamaCare would be drop-dead obvious. That would seem to explain the statist solutions uber alles establishment media's disinterest.